Steal Our New Citi ThankYou Points Travel Credit Card Trick — Swipe 10,000 Points! Here’s a new way to get up to 10,000 of your Citi ThankYou points right back in your account! If you have the new Citi Rewards+℠ Card and any other card that earns Citi ThankYou points, you’ll trigger the 10% points rebate on up to 100,000 redeemed points per year when you combine your accounts (you’ll have to call Citi to do this). Earlier this month, I transferred 16,000 Citi ThankYou points to Qantas. And this week, my Citi Rewards+℠ Card statement closed and added 1,600 ThankYou points to my balance. I haven’t made a single purchase with this card! If you have another card that earns Citi ThankYou points, like the Citi Prestige (and this likely applies to the Citi Premier℠ Card too), having the Citi Rewards+℠ Card is a free way to get 10,000 points back every year. This is an awesome, unexpected power-up – and the real reason why you might consider opening the Citi Rewards+℠ Card. The Citi Rewards+ Card Pairs Nicely With My Citi Prestige to Get 10% of My Redeemed Citi ThankYou Points Back per Year (up to 10,000). I Wish I’d Known This Sooner! It looks like having the Citi Rewards+℠ Card is working to unlock a 10% ThankYou points rebate when you combine ThankYou accounts and redeem points earned from any other Citi ThankYou card, like Citi Prestige (and likely the Citi Premier). One of the card’s perks is a 10% rebate on up to 100,000 points redeemed per year. You’ll also earn 2X Citi ThankYou points at supermarkets and gas stations on the first $6,000 spent per year (then 1X). 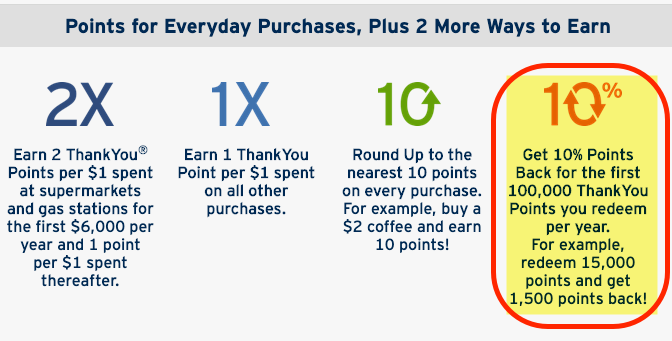 And the points you earn on every purchase will automatically round-up to the nearest increment of 10. So you’ll never earn less than 10 points on a purchase. Today, I noticed 1,600 extra points in my account. That’s cool, but where’d they come from? 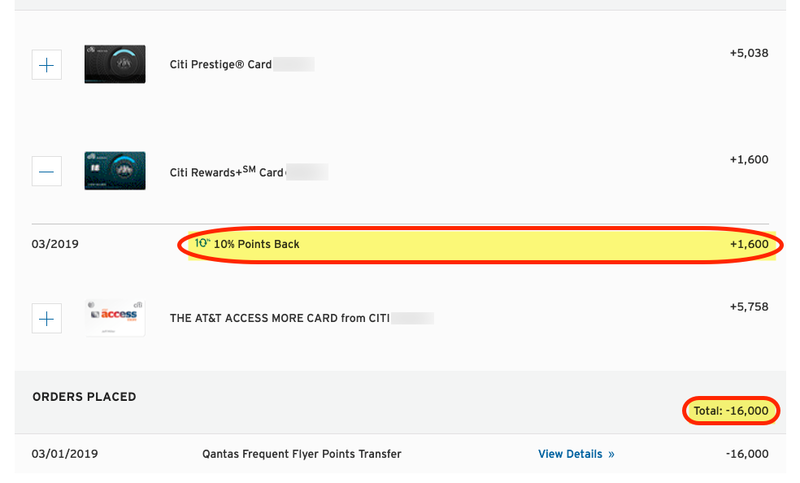 All I’ve done with Citi ThankYou points recently is transfer 16,000 of them to Qantas to book American Airlines flights. And I’ve never spent a single buck on the Citi Rewards+℠ Card. If this is any indication, I should be able to redeem up to 100,000 Citi ThankYou points per year – earned from any ThankYou points-earning card – and trigger the rebate for an extra 10,000 points back per year. Considering this card is free to keep, that’s an amazing perk that actually makes me want to keep my other ThankYou cards. 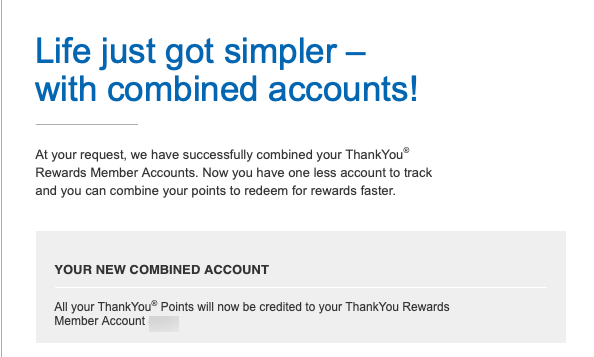 When you open a new Citi ThankYou card, you’ll get a new member account, so all the points you earn are in different buckets. But you can pool them all together in one place, like I’ve done. That means no matter which card earns the points, they’re all collected in the same place. Theoretically, you can do this online. But it never works. The easiest way is to call Citi and ask them to combine your accounts. After I called, mine were linked instantly. The Call Took Maybe 10 Minutes. It’s Worth It! I wasn’t expecting to use my Citi Rewards+℠ Card after product changing it from another old card, and certainly didn’t think those card’s benefits would transfer to my other ThankYou cards. But if linking them gets me an extra 10,000 points back per year – which I personally value around $200 – I’ll certainly take it! And it makes me want to keep my Citi Prestige – which just faced big changes earlier this year. With this card combination, there’s no doubt about keeping them both long-term. Should You Get the Citi Rewards+ Just to Get up to 10,000 of Your Citi ThankYou Points Back? Citi will NOT let you earn the sign-up bonus from more than one personal card of the same “brand” within 24 months. So if you open the Citi Rewards+℠ Card, you can’t earn the sign-up bonus on another ThankYou card, like Citi Prestige or the the Citi Premier℠ Card, for 24 months. Ouch! Those cards have much bigger sign-up bonuses. So I wouldn’t recommend getting the Citi Rewards+℠ Card unless you have NO intention of opening either of those in the next couple of years. With the Citi Rewards+℠ Card, you can earn 15,000 Citi ThankYou points after you spend $1,000 on purchases within the first 3 months of opening the account. Or you can do like I did, and ask Citi to product change an old card into this one. I didn’t get a sign-up bonus, but I don’t mind because I’d like to open the Citi Premier℠ Card down the road, and would much rather have the welcome offer from that card instead. But if you have all the Citi ThankYou cards you want, getting this perk is pretty nice. And hey, 15,000 Citi ThankYou points isn’t nothing for a card with no annual fee. Keep in mind, opening a new personal Citi card will count against your 5/24 status, so I wouldn’t touch any of them until you have all the Chase cards you want. The Citi Rewards+℠ Card just got a whole lot more attractive. Because when you combine your ThankYou accounts, the 10% rebate on up to 100,000 redeemed points per year works with other Citi ThankYou cards, like the Citi Prestige (and probably Citi Premier, though I don’t have that specific card). That’s worth around $200 per year for me, so I’m pleasantly surprised it’s working. Plus, when you combine it with points transfer bonuses and increased value for flights booked through Citi with Citi Prestige (or airfare, hotels, rental cars, and cruises if you have the Citi Premier), the deal is even better. If you have the Citi Premier and Citi Rewards+ cards linked in your account, and have earned a rebate for transferring points to airlines, please let us know in the comments. Will this new development inspire you to open or product change to the Citi Rewards+℠ Card?